Amazon is the biggest online retailer in the world. And the company has signed a $600 million contract to provide “cloud computing” services to the Central Intelligence Agency. Amazon now averages 162 million unique visitors to its sites every month. The firm’s business model depends on accumulating and analyzing huge quantities of personal data. Meanwhile, the CIA depends on gathering and analyzing data to serve U.S. military interventions overseas. During the last dozen years, the CIA has conducted ongoing drone strikes and covert lethal missions in many countries. Meanwhile, U.S. agencies like the CIA and NSA have flattened many previous obstacles to Big Brother behavior. The circumstances are ominous. Amazon is now providing a huge computing cloud for the CIA’s secrets -- a digital place where data for mass surveillance and perpetual war are converging. 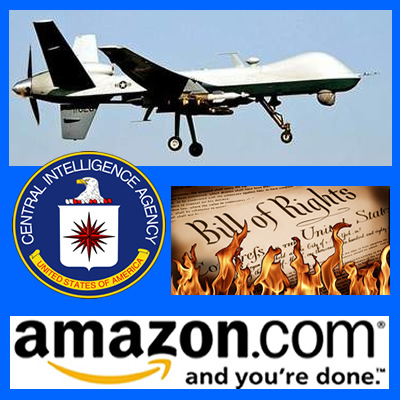 Please sign the petition below to challenge the Amazon-CIA partnership. Whats the matter with you? Stop this now. 34191 5 years ago Anonymous Ottawa, ON , CA What is going on with this world that our freedoms are being taken away. You hear about it after it's done.